Division Blocks are physically simulated, three-dimensional, energy-conserving, photosynthetic, neural-network-controlled blocks that were developed by Lee Spector, in collaboration of Jon Klein and Mark Feinstein, as a substrate for experiments in artificial life. Details are available in a paper presented at the 2007 Genetic and Evolutionary Computation Conference. 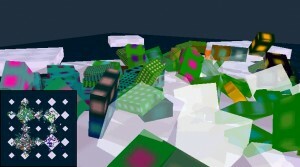 A screen snap of Division Blocks.